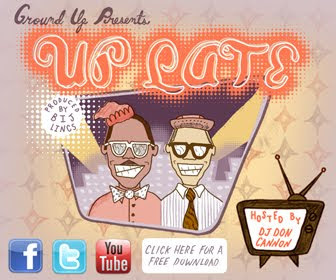 I recently completed a very interesting and eye opening illustration project for local rap dudes Ground Up. 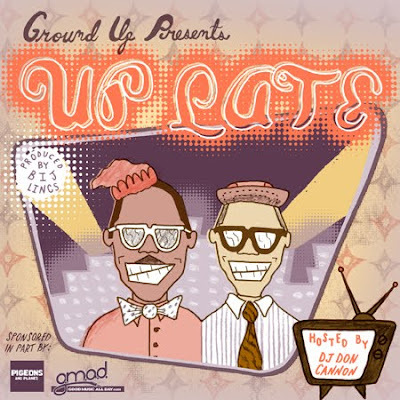 The project called for album artwork and some web banners to be used for their latest mixtape "Up Late" (actually released today April 5th, 2011). The guys contacted me out of the blue, and had a very high level of enthusiasm for my work from the get go. At first I was a little nervous to work with artists in this genre of music because I wasn't quite sure if my art could fit in with their sound. Once I did some research, and extensive listening to past mixtape efforts such as "Girls Who Smoke Cigarettes" and "Higher Ground" my gut feeling changed and I felt that I could effectively collaborate with these guys to create something that everybody liked. I've also never really shared my collaboration process for client work with the internet, and figured that this project in particular would be a good case study to direct prospective clients to in the future. 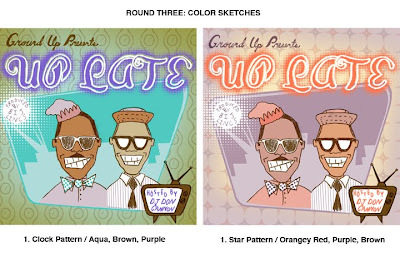 So above I also posted the first two rounds of black and white concept sketches, the color sketches, and then of course the final product. 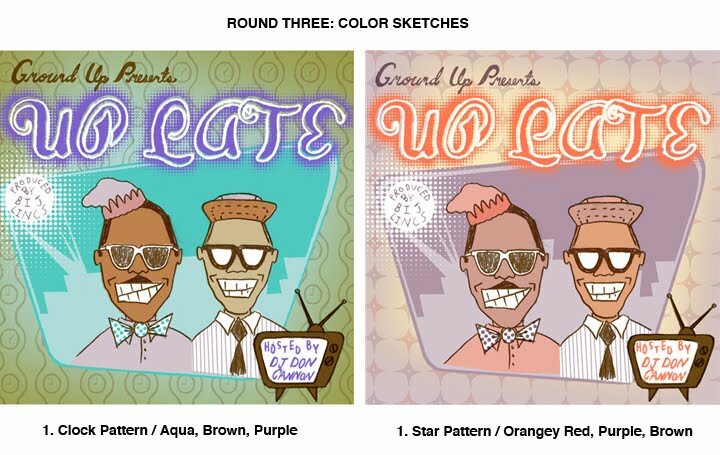 This was a unique project because of the high level on client input, and also because the project took on a completely new theme half way through, which then led to another round of "Late Night Talk Show" themed concept sketches. All in All I am happy with how the artwork turned out, I tried some new things with the computer and I think the result turned out a little slicker than usual. You never know when change is gonna come. A BIG thank you to: Malcolm, Al, Bij, Jon, Frank, and the rest of the Ground Up crew for initially contacting me and then turning this into such a memorable project.